Olympia Fields GC. Tournament photos below courtesy of GolfStat. Stanford finished 4th in first tournament of the 2008-09 season played at the venue of the 2003 US Open, Olympia Fields Golf Club in Illinois. Hosted and won by Illinois, the field was very strong including three of the top ten teams: defending national champion UCLA, Stanford and perennial power Oklahoma State. Qualifying to make the trip are Sihwan Kim, Joseph Bramlett, Dodge Kemmer, Steve Ziegler and freshman David Chung. Joseph is coming back from his long injury layoff from last year while David Chung, highly touted freshman, is making his collegiate debut. 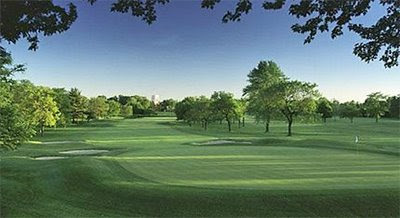 Here you will find a hole by hole review of the great Olympia Fields North golf course. You can find complete live scoring for the entire field here. FINAL RESULTS - Stanford finished 4th, 15 strokes behind behind host school Illinois, which was followed by Indiana and Oklahoma State. Bramlett led the way as he tied for 7th at 3-over par, followed Kemmer at 6-over, Ziegler at 7-over, Kim at 13-over and Chung at 15-over par. Joseph's third round 71 (he finished 4 shots behind the individual leader) was very steady finishing with 2 bogeys and one birdie while Dodge overcame two double bogeys with 3 birdies offsetting one bogey to shoot 72. Steve's 70, Stanford's best final round, had him firing a 33 on the back nine with four birdies and 2 bogeys. Sihwan's 73 included 5 bogeys and two birdies and David 71 resulted from a two birdie, 3 bogey round. ROUND 2 RESULTS - Although Stanford remains in a tie for 5th place, they have fallen 11 shots behind Oklahoma State. The day included rounds of 71 by Kemmer, three 74s by Bramlett, Ziegler and Kim, and a 75 by Chung. Joseph is in a tie for 7th individually after two days of play (68-74). His round included 4 bogeys and no birdies while 2 of his bogeys came on his last two holes. Dodge's solid 2nd round included 4 birdies and 5 bogeys while Sihwan had a good round going until he finished bogey, double bogey. Steve managed to avoid any doubles but he had 6 bogeys and 1 birdie. David's round looked promising but was marred by an opening double bogey and a triple bogey on #16. No question the team will need a very strong round to overcome the lead of the top two teams. ROUND 1 RESULTS - The Cardinal stands tied for 5th at 10-over par after the first round, led by Bramlett's tournament leading 68 and Kemmer and Ziegler's 73. Kim opened with a 76 and David Chung struggled to a 79. Stanford stands only 2 shots behind a trio of teams tied at the top. Bramlett's strong opening round included 5 birdies and 3 bogeys. Freshman David Chung's collegiate career included a quadruple bogey 8 on his 2nd hole, a tough start indeed. Two other double bogeys followed leading to his 79. Ziegler's solid 73 included a triple bogey on the 4th but he played well thereafter with 3 birdies to post his 3-over round. Kemmer's 73 was steadier with 4 bogeys and 1 birdie. Returning first team All-American Kim struggled early after bogeying 3 of his first 4 holes. He played 1-under par golf thru 15 after the rough start but then had two double bogeys on 16 and 18 to finish at 6-over. Sihwan Kim was not happy when his tee shot ended right of the bunker on 8. He hit this shot nicely to 5 feet and made the par putt. 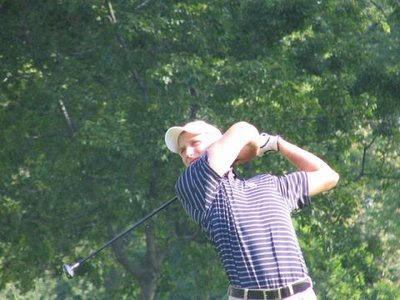 Steve Ziegler tees off on the long par 3 eigth hole. He hit a great shot and made the birdie putt. David Chung with a touchy downhill chip on 8. It ran 4 feet past and left of the hole and he made the par putt. We've added individual NCAA tournament statistics for each player who has competed for Stanford. In addition, for all the returning players, their individual web pages include swing sequences such as the one shown below. 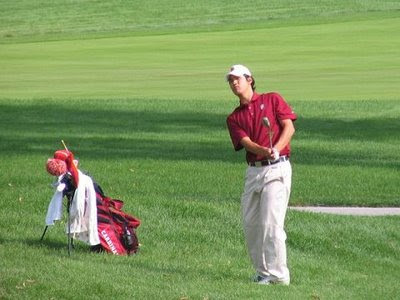 For example, here's the updated web page for sophomore All-American Sihwan Kim: http://stanfordmensgolf.com/kim.htm. Joseph Bramlett returned to competitive play and finished in 7th place with rounds of 68-66-75, trailing the winner Matt Grush by 6 shots shots. Joseph was only 2 shots back in 2nd after the first two rounds. The final day was blustery and Joseph went out in 39 to move out of contention. Here's an article from the Scramento Bee describing the final round. All final scores are shown here: http://www.statefairgolf.net/events/allscores.asp. A local Sacramento Bee story had this to say about Joseph after the second round --- "Bramlett is a 20-year-old Stanford junior who was the youngest to qualify for the U.S. Amateur at age 14 and has been a star in the making for years. 'I'm just thrilled to be competing again,' said Bramlett, a Saratoga resident who didn't swing a golf club from January through July of this year after bruising his wrist in a team training exercise. "Here's the Sacramento Bee story after the 2nd round. 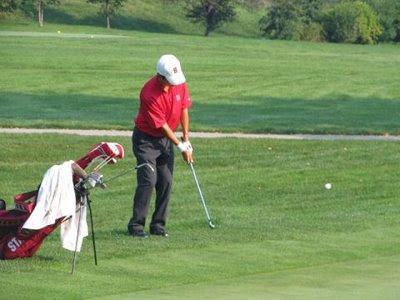 Joseph hurt his wrist in a training accident with the golf team at the end of 2007 and missed the entire spring and summer golf seasons. After his outstanding freshman campaign at Stanford where Joseph earned 2nd team All-American honors it was a significant loss for Stanford's team that went on to finish 2nd in the NCAA Championship without Joseph.